Okay, we've all seen the pictures from Raisu plastered all over IG, Facebook and the sort. 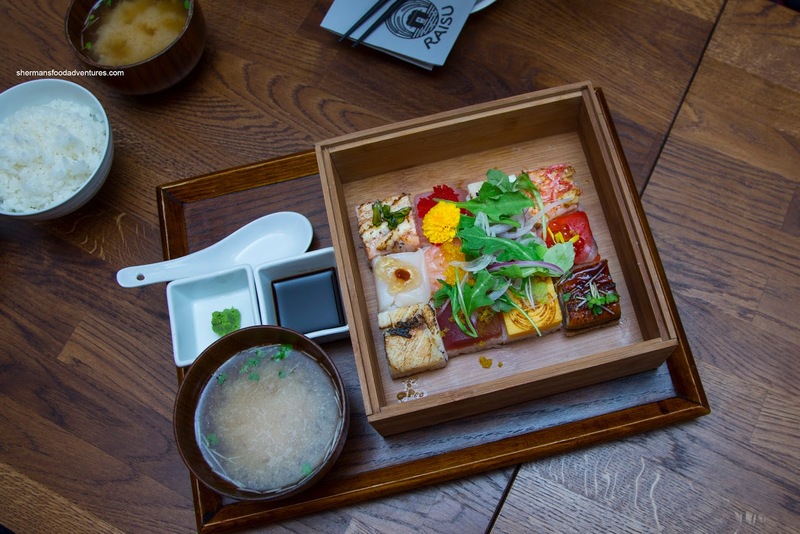 Beautifully constructed dishes including the pressed sushi box, their precious bento box and of course the overloaded charaishi don. 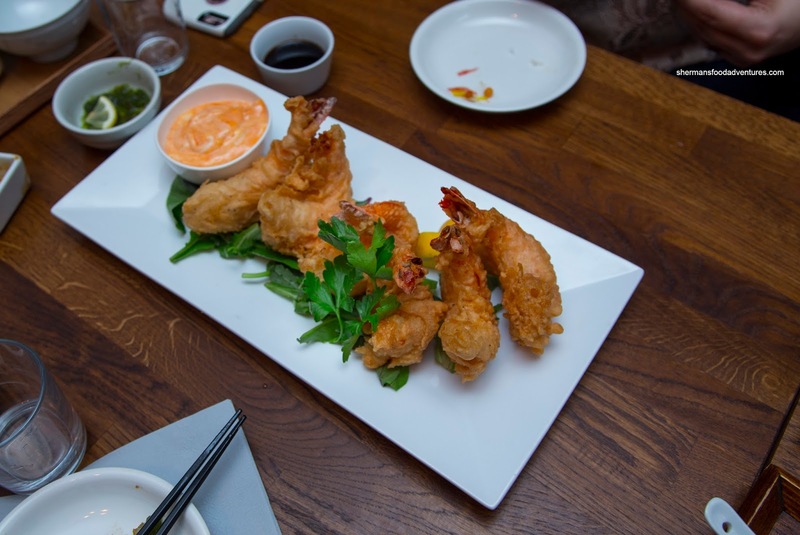 Brought to you by the same people behind Kingyo and Suika, Raisu offers up a somewhat similar experience, but with a generally different menu. 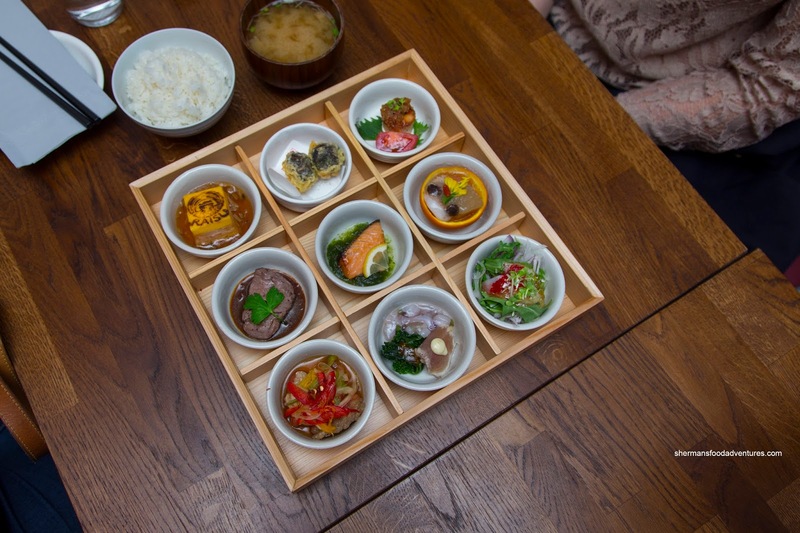 Whereas Kingyo and Suika are Izakayas at heart, Raisu serves larger main dishes that aren't conducive for sharing, yet we did that anyways. I was able to reserve the Sho Ka Do Bento consisting of 9 little dishes that included steak, scallop, tuna tataki and wasabi ika, fried shiitake mushroom, grilled salmon, minced shrimp & scallop Japanese omelette, stewed shrimp & vegetables in an orange bowl, vinegar soy marinated seafood and Japanese tai snapper sashimi salad with apple vinegar jelly. Without going into detail about each one, I found the fish quality to be decent but some of the items were quite similar. The fried shiitake was excellent with a burst of umaminess. 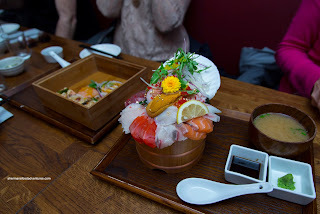 Of course, we also got their other "pretty" dish in the Ocean's Offerings consisting of pressed sushi topped with hamachi, saba, salmon, snapper, sayori, snow crab, tuna tataki, unagi, amaebi, hotate and botan ebi. Again, to keep this from becoming an essay, I would say the quality and preparation of the ingredients were above-avereage. The sushi rice was on point with a moist chewiness and balanced seasoning. 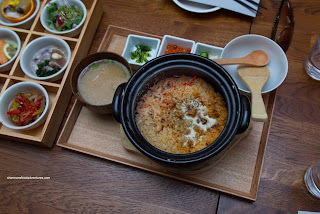 Okay, our last limited dish was the Seafood "Donabe Takikomi" Rice. It didn't look like much before being mixed with pickles. However, it was pretty tasty albeit dry. The saltiness of the crab butter miso was minimal. Rather, it gave way to a sweet brininess and taste of the sea urchin. The shiso herb salmon caviar added brighness while the snow crab flavour was somewhat lost. Another IG-worthy dish was the Deluxe Seafood Bowl which has been doing the rounds on social media. This was spectacular to look at, yet ultimately only somewhat above-average. Most of the ingredients were quite good, but the uni wasn't up to par as it was more fishy than sweet. The rice was just right being chewy, well-seasoned where it complimented the sweet buttery fish on top. Loved the ahi tuna the best followed by the hotate. We got a double order of the Ebi Mayo and these gigantic monsters were more like mini-lobster tails. Sporting a gluten-free batter, they were crispy and not greasy at all. The large prawn was meaty with a solid snap. It was naturally sweet and aromatic. Loved that they served the mayo on the side as we could put as little or as much as we wanted. I liberally doused mine into the dip. 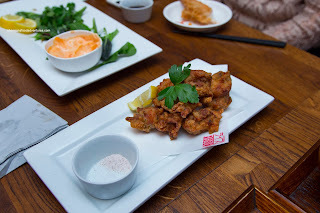 The Chicken Karaage was also coated with a gluten-free batter which was also crispy and light. The chicken was succulent and had a nice rebound texture. It wasn't inherently seasoned too much, but the side of wok salt and wedge of lemon did the trick. 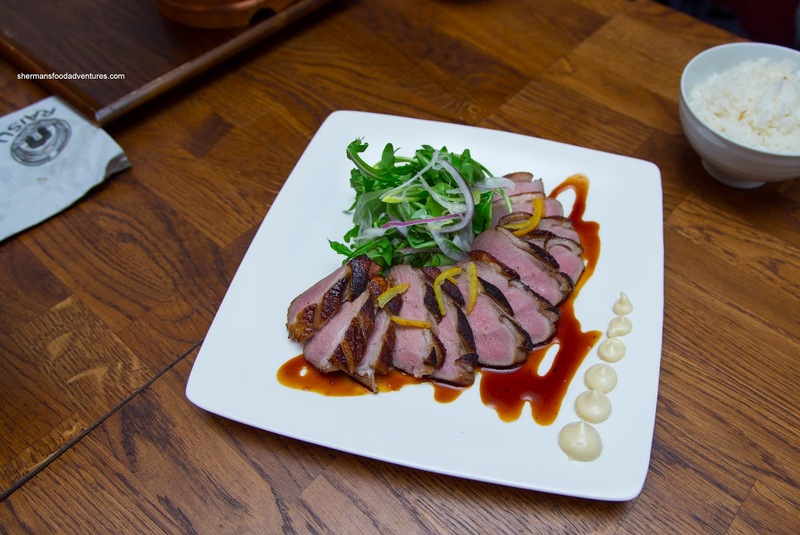 Lastly, the Grilled Duck was fabulous with rendered skin and appealingly tender meat. It still retained a meatiness though. It was super flavourful with a gamy sweetness (from the sweet miso marinade) which had depth. The yuzu mayo sauce on the side was creamy with a touch of tartness. This duck dish as well as most of the other cooked items were actually quite tasty and well-prepared. The raw items were beautiful and totally IG-worthy, but for the price, I wasn't as convinced. It wasn't like they were bad. In fact, it was far from it. 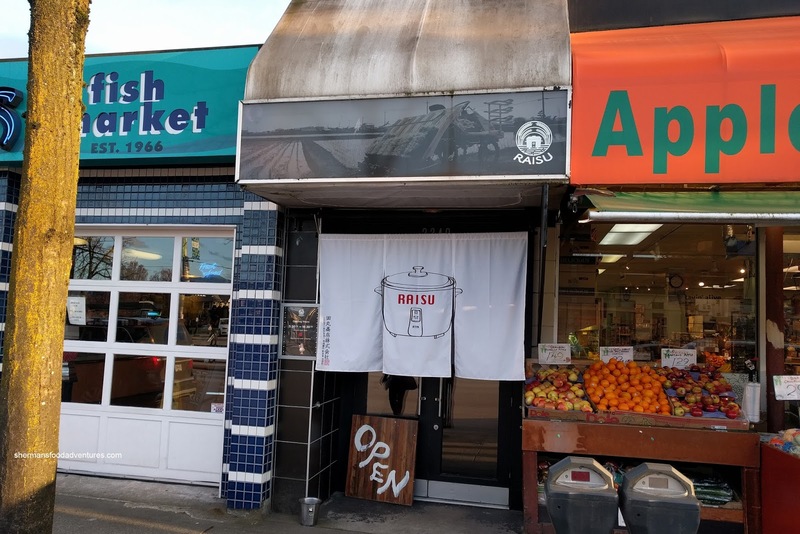 I guess with the many options for Japanese food in the Lower Mainland, there will be plenty of competition.